In the book of John, Jesus makes seven statements that begin with "I am...". This seven week series looks at the significance behind each of those statements. 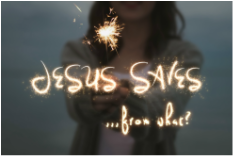 We "know" that Jesus saves. We use that phrase often as followers of Jesus because we believe that He came to earth to save us but in this series we will see Jesus claims of "I am" that will clarify the "Saves from what?" question that may be asked by many. Right after Jesus feeds 5000 people with five loaves of bread and two fish, He then tells the crowd that he is the Bread of Life. He compares that title to the manna that their forefathers were given as a temporary supply to the eternal satisfaction that comes through believing in Him (as the Bread of Life). He also says those who will put faith in him “would never go hungry again.” The hard teaching comes when he indicates that the bread is his flesh and they should eat of it. People started leaving after that! Right after the Jewish leaders are trying to figure out who Jesus is, He says, “I am the Light of the World” and that those who believe in him will never walk in darkness. When we come to Jesus we walk out of darkness of misunderstanding and into the light of clear thinking. Belief in Jesus gives us the Holy Spirit in our lives who clarifies and allows us to see the darkness for what it is. Main Point: Jesus as the Light of the Word is the ONLY solution to driving back the darkness. Jesus as the Door indicates that he is the only entrance into the fold or flock. The only means of salvation is through "the door". His voice is the one the sheep recognize as the one to which they listen. Entering through the door of Jesus brings abundant life and security! Jesus as the good shepherd was the one shepherd that would take the place of the sheep in the sacrifice. He was the only possible means of salvation. As a shepherd, he sacrifices himself for the good of the flock. There is an intimacy between shepherd and sheep that does not exist outside of this relationship. The Good Shepherd calls us, he saves us and he secures us forever! Main Point: Jesus, as the Good Shepherd, saves us from a life of wondering! ne the sheep recognize as the one to which they listen. Entering through the door of Jesus brings abundant life and security! The wording of the Way indicates a Highway – he is the path to the Father. It is an exclusive path which is hard for other religions to grasp because so many other religions bank on an “open concept” of salvation – many paths to God. Jesus made it clear – He was the ONLY way. Along with that he places an exclusive emphasis on Truth, also. He embodies it because truth is from Him and Him alone. As “the Way” – he shows us, NOT DIRECTION, the actual path. Main Point: Jesus, as the way, saves us from wandering. Jesus is the source of life in this analogy and he makes it clear the Father is the vine dresser or the Husbandman of the vine. He cares for it and prunes it and lifts it up for better fruit production. In this message we see that Jesus is not talking about the loss of security of salvation but about the process of making us the best fruit producers in the world! Main Point: Jesus, as the true vine, saves us from living powerless!